In Verona, the main shopping area is concentrated in no more than 700 meters span, most of which pedestrian precinct. 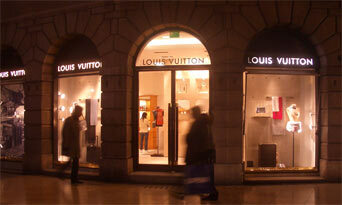 Here you will find department stores, brand shops, jewelry, antique shops and much more. In Via Mazzini, Via Cappello and Corso Portoni Borsari you will find designer shops such as Gucci, Armani, Dolce & Gabbana, Louis Vouitton, Prada, Diesel, Cartier, Mont Blanc, Iceberg, Etro, Fendi, and much more. The antique shops area is around Corso Santa Anastasia. You will find jewelry in Corso Portoni Borsari and Corso Santa Anastasia.